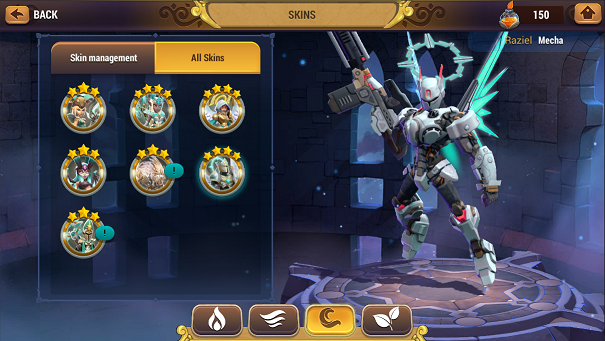 You need Dazzling Ink to purchase a skin. 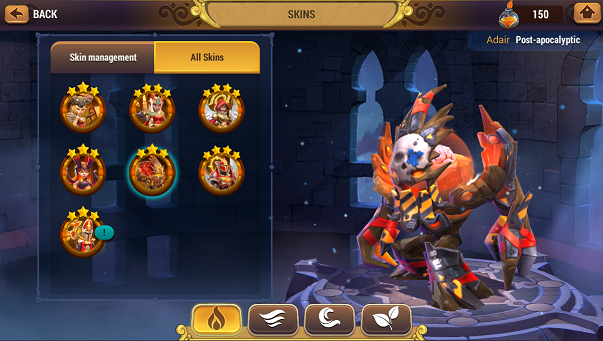 Each creature element counts as a different skin. 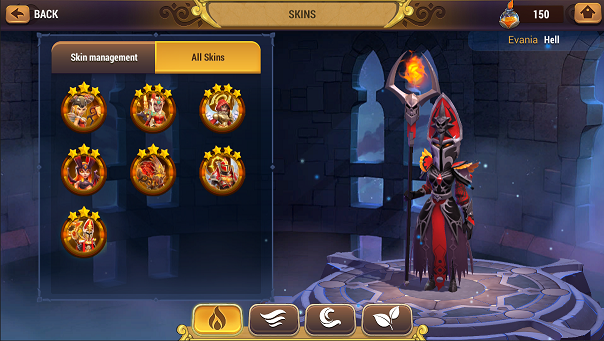 Skins can be purchased and applied only for owned creatures that are evolved. 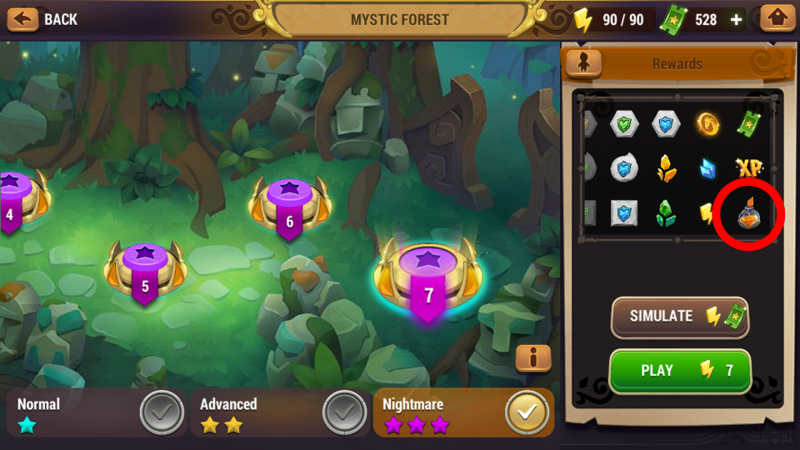 You will find Dazzling Ink in most of dungeons in the game. The Auto Target allow you to define a special behaviour for each Boss / Mini-boss fight once is defined, the AI will prioritise this targets every time that you replay the dungeon. It is unlocked at player level 10 and is only available for Special Dungeons and Raid fights. The Auto Target can be saved by specific levels or for all the levels of the same region. 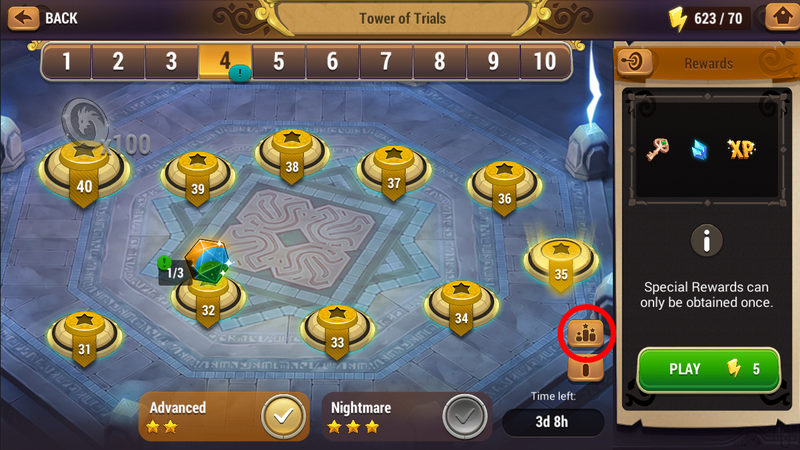 New difficulty level for Beneficial, Wrath and Strength dungeons. Compete with other players in the new leaderboards to prove who is the fastest one. Ranking by completing all levels. Ranking by completing stages (10 levels). Faster for completing Beneficial Level 11. Faster for completing Wrath Level 11. Faster for completing Strength Level 11. New channels can be found in the chat! Meet with other players in the room that you choose. 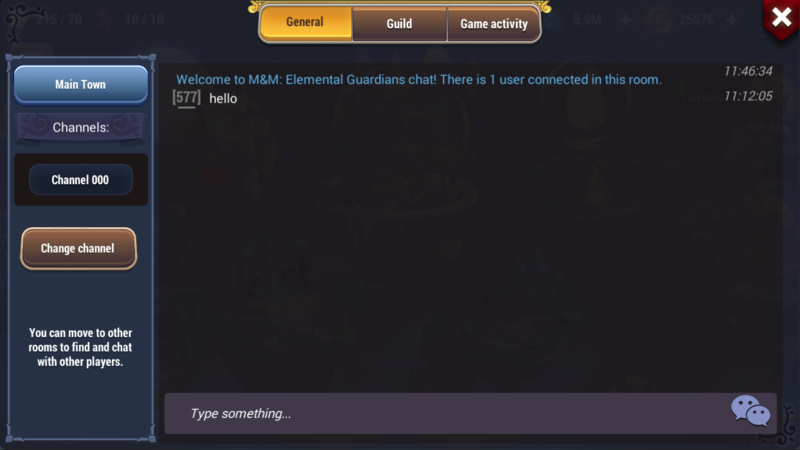 New section announces in Game Activity where you will find all the important communications. Lizardman Archer – Water 3% increased speed to human allies and 3% increased defense to beastmen allies. In addition to the export user data file, there’s a new button in “Settings -> Connect” tab to generate an export code. This can be used, if you share it with a third party, to automatically grab user data. 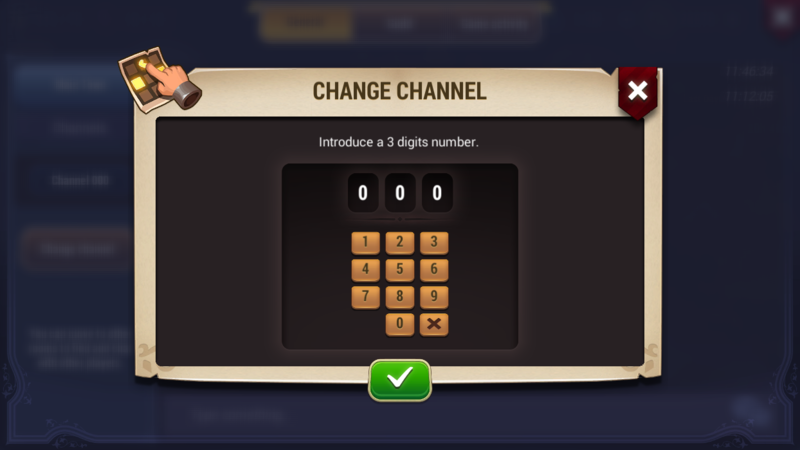 Everytime you generate a code, the old one expires. The following bug has been fixed: Water Shantiry Mummy 2nd spell isn’t working as intended. The following bug has been fixed: Fire Ebon Knight 2nd spell increases enemy cooldown instead of reducing its own. The following bug has been fixed: Earth Masaru Monk aura is not increasing the effect probability when leveled up. The following bug has been fixed: Fire evolved Panda Guardian 1st spell attacks twice. The following bug has been fixed: Air Angel Zealot 2nd spell skill up is not working as intended. The following bug has been fixed: Water goblin trickster 3rd skill upgrade info is not displaying which effect is increasing. The following bug has been fixed: Water Angel Mystic Boss in Heroic Dungeon (Plant/Goblins) use revive on itself instead its allies. The following bug has been fixed: Earth Masaru Monk aura level up effects are not related to the aura. The following bug has been fixed: Fire Panda 3rd spell description displays a 0 instead a 5 on concentration points needed to trigger an effect. The following bug has been fixed: Air Angel Zealot 2nd spell is not indicating the healing effect in the description. The following bug has been fixed: 2nd fire Emerald ranger spell shield effect duration is missing in the description. The following bug has been fixed: Earth Juggernaut 3rd spell drain is inflicting incorrect damage. The following bug has been fixed: 3rd Air skeleton archer spell text is incorrectly updated when is upgraded. The following bug has been fixed: 3rd Earth skeleton mage spell text is incorrectly updated when is upgraded and it’s not working as expected. The following bug has been fixed: Battle infinite stuck when Arkenos revives its allies. Vous avez besoin d’encres éblouissantes pour acheter un skin. Chaque élément de créature compte comme un skin different. Vous trouverez des encres éblouissantes dans la plupart des donjons. Patience, car les encres éblouissantes sont un matériau très rare, et ne peuvent être trouvés qu’en de très rares occasions. Le ciblage automatique vous permet de configurer un comportement spécifique pour vos créatures, à chaque bataille de Boss ou de mini-Boss. L’IA de vos créatures priorise ses cibles en fonction de votre configuration. Vous débloquerez cette option en atteignant le niveau 10, et ne pourrez l’utiliser que dans les îles de Dragonbrume et durant les batailles de Raid. Ou bien en maintenant appuyé le bouton d’AUTO bataille. Le ciblage Automatique peut être sauvegardé par niveau, ou pour tous les niveaux d’une même région. Une toute nouvelle difficulté est disponible pour chacun des trois donjon de Glyphe. Vous pourrez y obtenir des Glyphes épiques et légendaires. Rivalisez avec les joueurs du monde entier dans les nouveaux leaderboards, et prouvez que vous êtes le plus rapide! Vous pouvez maintenant créer vos propres canaux de discussion dans le chat, et discuter avec vos amis! En plus de l’option “Exporter les données”, dans les “Paramètres > Connexion”, nous avons ajouté une nouvelle option: “Exporter le code”. Cela vous permettra de créer un code et de le partager avec un logiciel tiers et d’automatiquement copier les données. Chaque fois que vous créez un nouveau code, le vieux éxpirera. Les créatures peuvent maintenant résister a la mécanique de Purge. © 2017 Ubisoft Entertainment. All Rights Reserved. Ubisoft and the Ubisoft logo are trademarks of Ubisoft Entertainment in the U.S. and/or other countries.